​JLL’s Nikki Kern and Kim Doyle represented ownership, and CBRE’s Cal Wessman and Brad Serot represented Fifth Third Bank in a 145K SF lease renewal at 222 South Riverside Plaza. 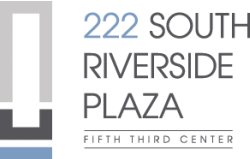 It is the second major lease renewal at 222 South Riverside since ownership invested $50M to renovate the 40-story building inside and outside. Fifth Third Bank renewed its 145,000-square-foot lease at 222 South Riverside Plaza in downtown Chicago. The firm has been a tenant in the building since 2005, and occupies the top floors in addition to a 4,000-square-foot retail bank branch on the ground floor. Fifield Realty Corp. capitalized on the demand for luxury apartments in the north suburbs with E2 apartments in downtown Evanston. The two-building development is now home to some funky public art.